In a strange way, Raven Flight reminded me of an adventuring, single-player RPG. Specifically, I had thoughts of the Zelda games as I read about Neryn's adventure throughout Alban in search of the Guardians. First, you've got the ultimate 'Final Boss' you must defeat; but before you can defeat him, you must journey through to different places and improve upon your fighting skills as well as acquire the different knowledge, means, precious items, treasures, etc. that are needed to fight the ultimate battle. You journey away from home and learn that you have the ability, that you are the one chosen to help free the lands. You then reach a point where you finally accept and comprehend (even if very little) the role you must play in this war. Then you are told by some prophet or some random higher being, that there are several trials you must accomplish, knowledge that must be acquired, treasures to seek... whatever it is. Then finally, you gather all of your strengths and use all means you have learned to defeat the 'Final Boss'. I suppose the only difference so far is that Neryn doesn't have smaller, less significant, yet necessary 'Bosses' at different areas to defeat along her way. But if she did, that would be pretty neat. I didn't pick up on this idea until after I started reading Raven Flight. I'm still not sure if it's the right comparison to make, but the thought came to me and it stuck. The rebellion against King Keldec has taken a turn with a deadline in the midst and a secret weapon on the rebels' side. Neryn must now hurry across the lands of Alban to seek out the "Big Ones", or the four guardians of north, south, east, and west. As the Master of Shadows has mentioned, Neryn still has a lot to learn about her canny gift of being a Caller and in order to do so, only the Guardians can teach her. Neryn, with a reluctant Tali as her guard, first travel to the west to see the Hag of the Isles before heading north to wake the Lord of the North. But their journey is a dangerous on with Enforcers about and common folk ready to betray any stranger at the sight of anything unnatural. Meanwhile, the Good Folk, having agreed to aid in the rebellion's efforts, have already spread word from area to area. Uncanny beings of big and small are well versed in the goings on of their Caller as well as the rebellion itself. Though some are reluctant, the Good Folk do not hesitate to aid Neryn's journey through the lands with small bits of advice here and there, or simply just trivial gestures. Neryn is well on her way to learning and honing her skills as a Caller, though she still has one more Guardian to meet, as well as one other Guardian to find again. I thoroughly enjoyed this book. It's an adventure of a quiet kind, but there's an underlying tone of building excitement as the story progresses. Neryn's development is immense, though I would say that she was already quite well-developed to begin with. Tali stands out most of all as her character comes upon her own growth and transformation from being the harsh leader tasked with babysitting an amateur Caller, to acknowledging Neryn's strength and seeing her as an equal for their cause. Flint gets little time in this book outside of snippets here and there, but his presence is very much felt--though I can't say that much happens in the sense of character development for him since he continues to live his double life as a rebel spy and continues to drown in the misery of all he must do and all the responsibility on his shoulders. The story progression feels like it's pacing forward nicely, although really, the only things that have happened is Neryn meeting the Guardians, learning that she already has what it takes to be a Caller, learning that she's already quite adept at using her gift, and then learning ways to better improve her skills. A lot of time passes by as Neryn is tested again and again, seemingly to further tout her claim as a Caller. A lot of time passes as she continues to struggle with her conflicted feelings about whether or not she should even use her gift in the first place and whether or not she can use her gift properly. While it's a good virtue to have in a hero, sometimes you DO wonder why Neryn is still so hesitant and why it continues to take so many days just for her to figure out certain obvious tacts upon meeting the Guardians. 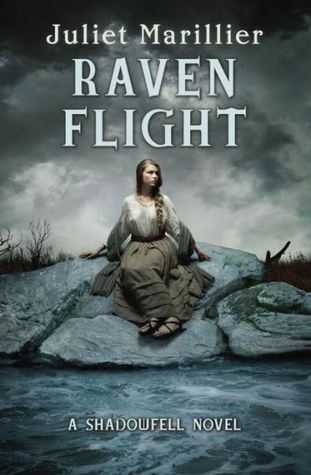 Adventures are my favorite types of fantasy stories and Raven Flight certainly hit upon all the perfect notes of an high fantasy adventure. Now that the setting is much more developed and much more matured from the events of Shadowfell I feel like there's a smoother progression in this second book for all the same ideals. The story certainly picks up more in this sequel than the pacing had been from the first book, which is rare considering the fact that sequels usually don't impress much. This review was originally posted at Ani's Book Abyss / BookLikes in February 2015. COYER Summer Vacation 2016 Starts Today! My TBR List -- June Winner!